The GlobalConnect platform is the ecosystem through which dealers interact with General Motors. It is a collection of many different applications, owned by disparate groups and some third-party companies. The applications address everything from ordering vehicles to receiving the latest industry news to dealer recognition programs. The existing GlobalConnect was a default sharepoint site, in which everything was text-heavy. It consisted of pages and pages of text links; blue, underlined. It was very difficult to navigate, links were repeated and illogically organized. My recommendation was to make the interface more visual by giving the applications icons, to allow the user to organize the apps themselves and generally make it more personalizable. I also separated applications (sites with function, such as placing an order) from content (sites with consumable content, such as articles, but no actions.) We eliminated redundant links and created an “app library” (alternatively an “app store”) so that users could browse through the many apps available to them, learn more about the apps, receive support, and give feedback as to whether the apps were helpful to them in performing their job duties. For the content apps, we created a library with a carousal viewer. Dividing GlobalConnect into apps and content also helped the users to make logical connections between where things should be stored and thus where they could go to look for them. We also instituted more rigorous search tools. 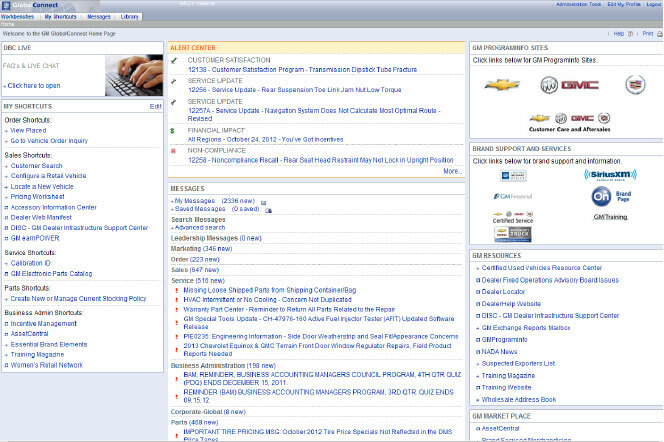 Though the initial redesign launch was for North America, the ultimate user base for GlobalConnect was all dealer employees globally. While developing the concept, I visited many local dealerships to develop a dialogue about how we could better support them in their job duties. 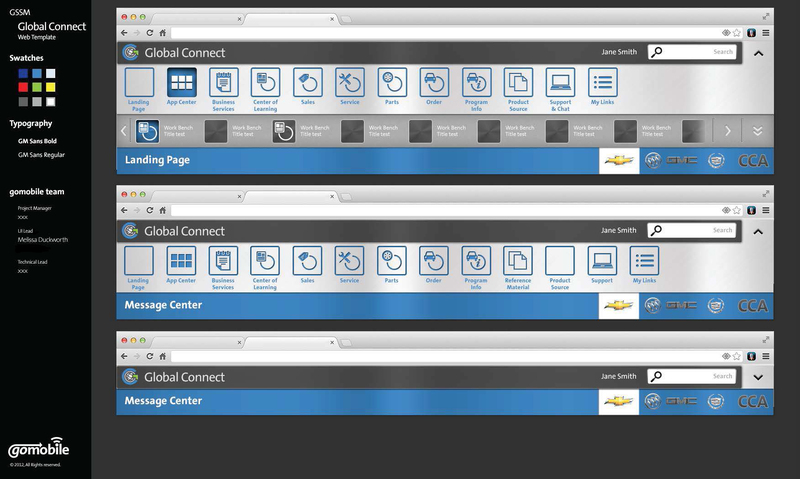 We worked closely with many different IT groups and app owners to bring their apps stylistically into alignment with the new GlobalConnect vision; publishing a style guide for them to use on future (regularly scheduled) graphic refreshes of their own products. Redesigning GlobalConnect was a monumental undertaking with high visibility, risk, and accountability. There were many stakeholders and it affected not only every dealership employee, but also many IT and corporate business groups. I was the lead designer, negotiating with stakeholders to develop, drive, and implement a new organizing philosophy for the platform. I also mentored and directed the junior graphic designer in developing the look & feel, style guide, and production graphics throughout the this project. Beyond the interpersonal complexity of the project, on the technical side we were balancing our ideas with the functional limitations of Sharepoint, determining in what areas we could customize and in what areas it was more advantageous to work with Sharepoint’s default hierarchy approaches. These requirements drove many choices with regard to defining administration roles and permissions for user groups, organization of apps and content (and managing who had access to what), and managing multiple brands (each of whom had their own Sharepoint identities). Objective: To redesign the GlobalConnect platform, making it more intuitive for dealership employees to use.